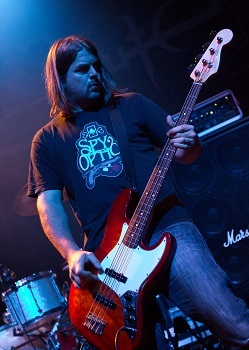 After a day of high temperatures and sunshine, it was time for things to get really hot – Clutch’s gig at the Forum was sold out, so I was expecting things to get really hot in there as the place filled up. First up were General. Hailing from Coventry they really got things off to an excellent start. Good heavy riffs and great vocals combine to give music that has a real Black Sabbath feel – I’d certainly recommend them to any fans of Black Sabbath. They got a pretty large crowd (possibly helped by the nearby Bull and Gate pub being closed meaning many fans who would normally wait in there till the headliners actually came in to watch the supports), and more importantly they got a good reception from the crowd – I think they’ll have made plenty of new fans tonight. It was noticeable that they looked to be having a great time on stage – their singer in particular could barely stop grinning. Definitely a band that’s wellworth a listen. 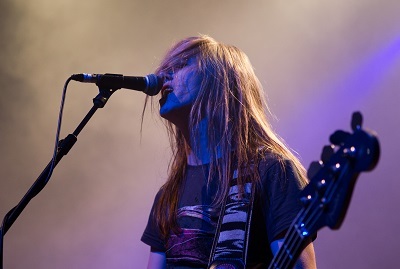 Next up were Sons of Icarus, a hard rock band from Guildford. I did enjoy their set, but would have preferred to see them before General – coming after General they felt like a bit of an anticlimax, simply because General were so impressive. Next up was Clutch. By this time the venue was absolutely packed and it was getting hot inside, but when Clutch hit the stage people forgot about the heat and crowding. Clutch hit the stage and right from the start put in one hell of a performance. These guys are sounding better than they’ve ever sounded, with their latest album getting superb reviews. Unsurprisingly tonight’s show kicked off with a track from the new album – the title track ‘Earth rocker’, and it was almost halfway through the show before we started to hear any of the older material. The show tonight consisted mainly of material from the new album, with most of the songs on the album getting played tonight, and it’s clear to see why – it just sounds fantastic. 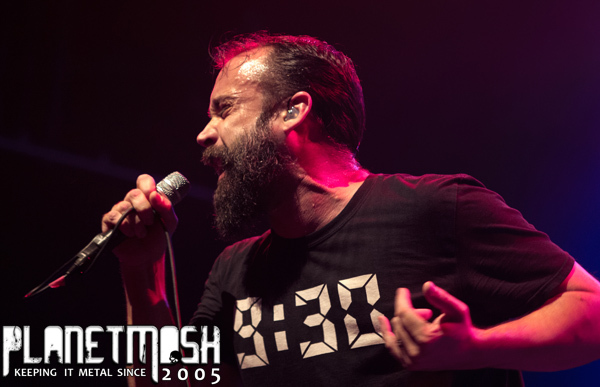 Clutch aren’t one of those bands that just stand still and play – instead Neil Fallon on vocals roams around the stage and works the crowd like the professional he is. After taking photos for the first three songs we had to leave the venue and head round to the main entrance to check our camera gear in before going back inside thanks to a new venue policy. Normally this sort of thing is a pain, but it did have the benefit tonight of giving me a few minutes to cool down before going back inside for a cold drink and some superb music It really was a superb gig, and I hope that the band will find time next year for a return trip to the UK for more gigs. If you’ve never seen Clutch before then take my advice – go and see them next time you get the chance. They really are a truly excellent live band.